The first generation of King Regula cameras was introduced around 1950. 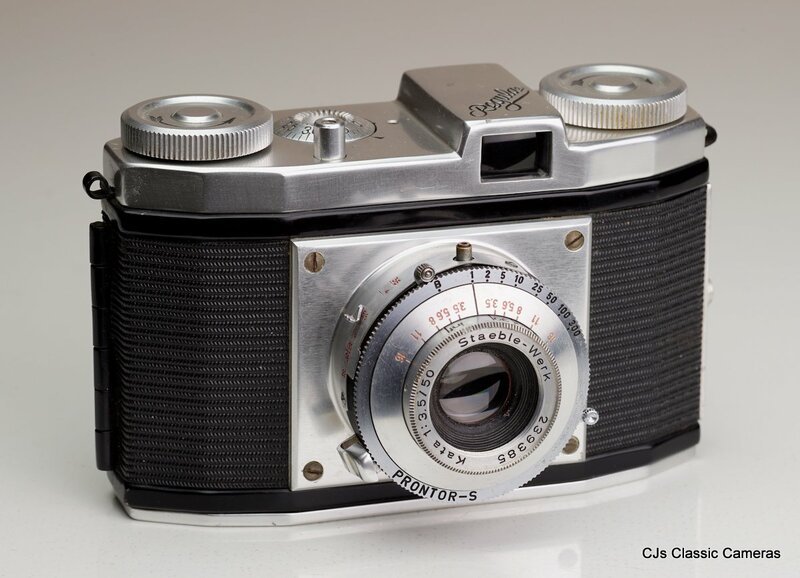 They were simple viewfinder cameras with body mounted shutter release and came with either wind knobs or levers. The naming of the models was rather incomprehensible. The first were called King Regula IP and King Regula II. 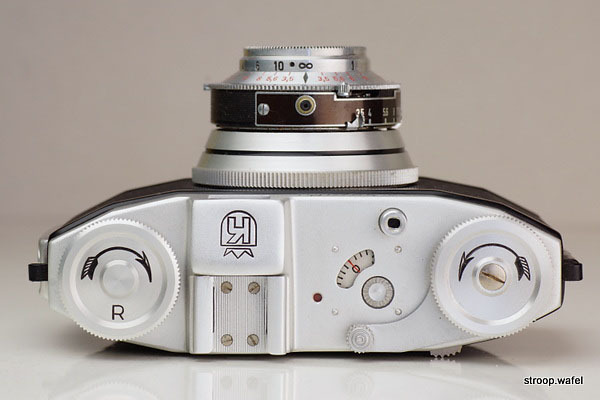 Then there was a series of models called the I-A up to I-F. In addition there was the I-P in several versions, some identical to some of the I-A to I-F models. Finally, there were the I-Po and the I-C, with the latter probably not part of the I-A to I-F range, for reasons explained below. 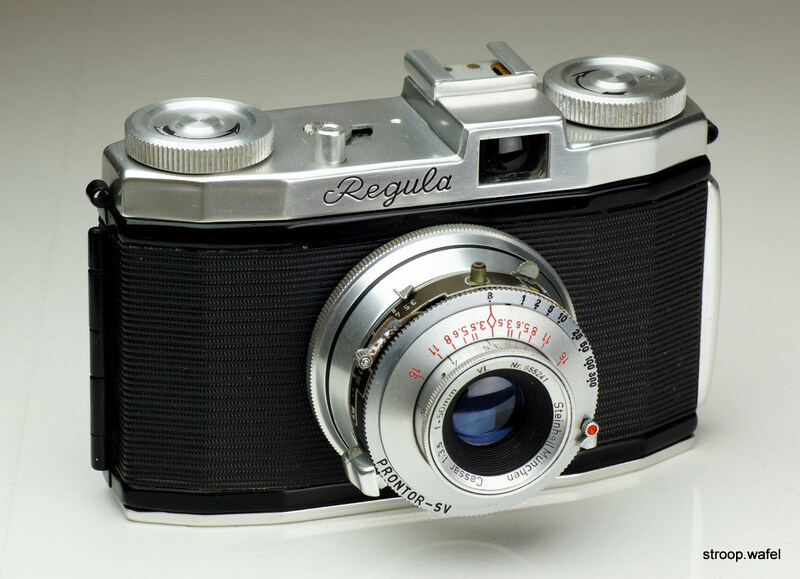 The King Regula IP appears to have been the first King Regula model based on serial numbers, but several versions exist. 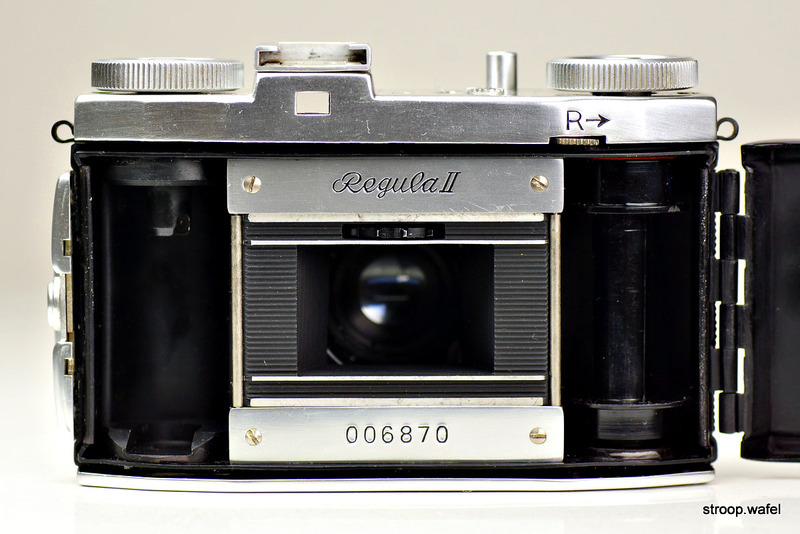 The first version had a thicker body, a rectangular metal front plate, a conical frame counter on top of the camera and a flat viewfinder housing with King Regula engraved. Some had an accessory shoe but these may have been added later. It came with an old-style Prontor-S shutter with black and white shutter face. Some had an extra metal ring with depth of focus marker like the second example below, other ones did not. The lens was either a Staeble-Werk Kata or a Steinheil Cassar, both were 50mm f/2.8 lenses. 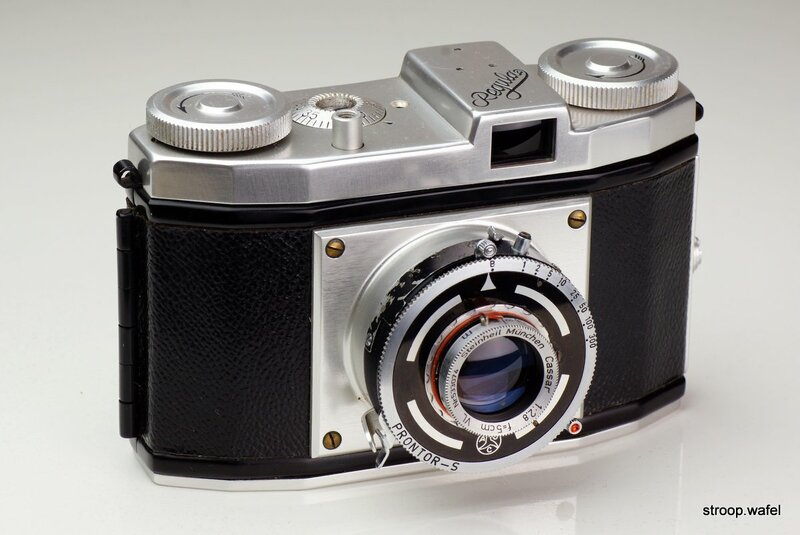 The second version had a new design similar to all other (later) I series King Regulas, apart from a slightly different viewfinder housing, which was flat and did not yet bear the King emblem. 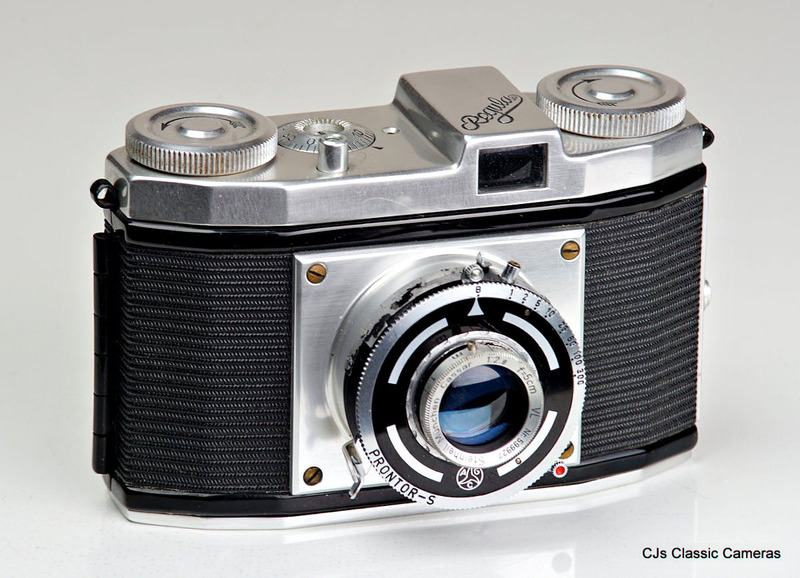 It had a Prontor-S or SV shutter and a Steinheil Cassar f/2.8 lens. 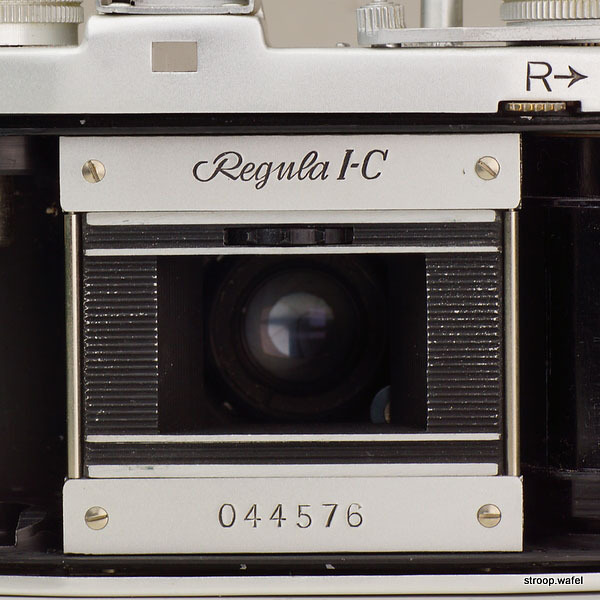 The first version of the King Regula IP with Steinheil Cassar 50mm f/2.8 len in Prontor-S shutter, in some places referred to as the 'Ur Regula'. 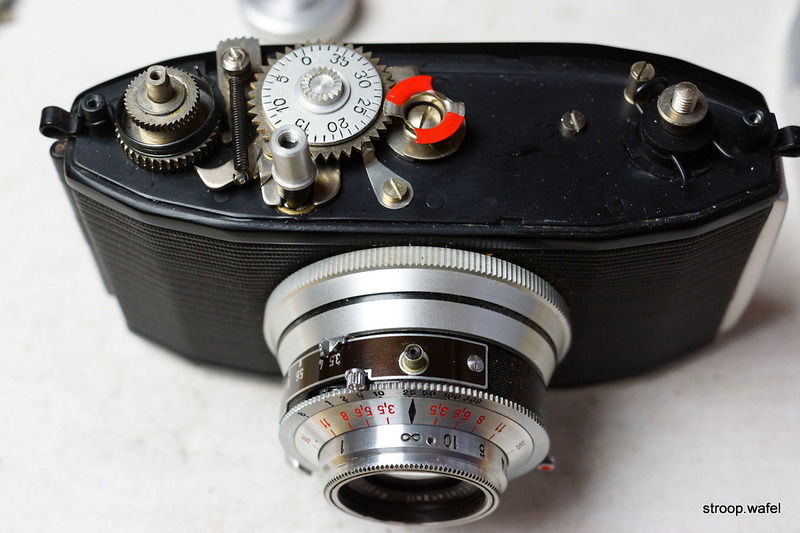 This was an 'old style' lens with focal length indicated in cm and a small screw as focus stop, later King Regula I had a newer version with internal stop and focal length in mm (see below for examples). This early King Regula version had regular leather covering, instead of the herring bone pattern leatherette typical of all later King Regula I. Body serial# 000865. This example is almost identical to the one above but already has the herringbone covering typical of the Regula I and II series. Body serial# 001839. 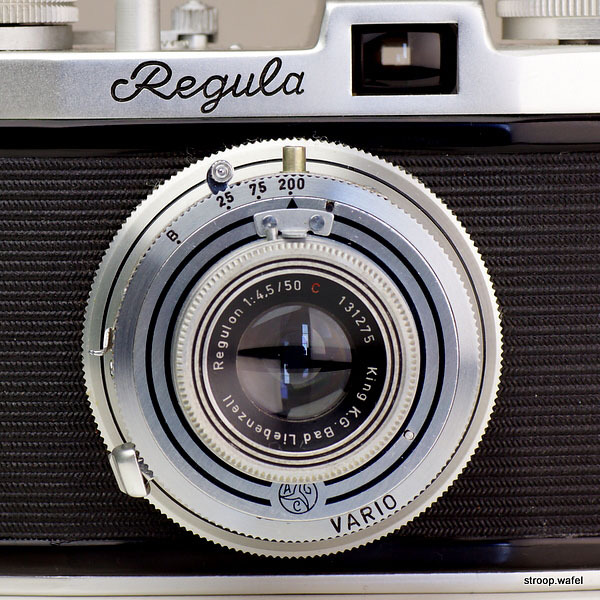 The same King Regula IP version but with new style Steinheil Cassar lens, a depth of focus ring added onto the shutter and a small cover over the shutter release on the shutter itself. 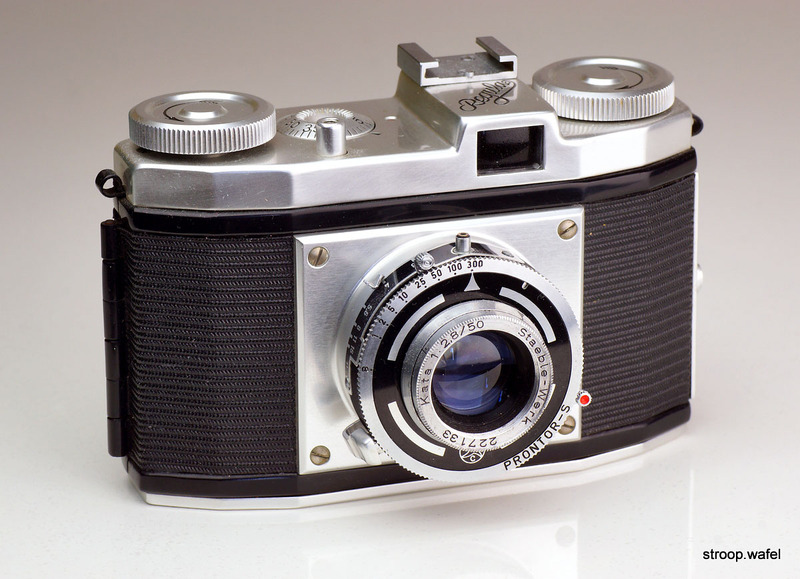 Note that the depth of field ring covers the same black shutter plate as on the model above. 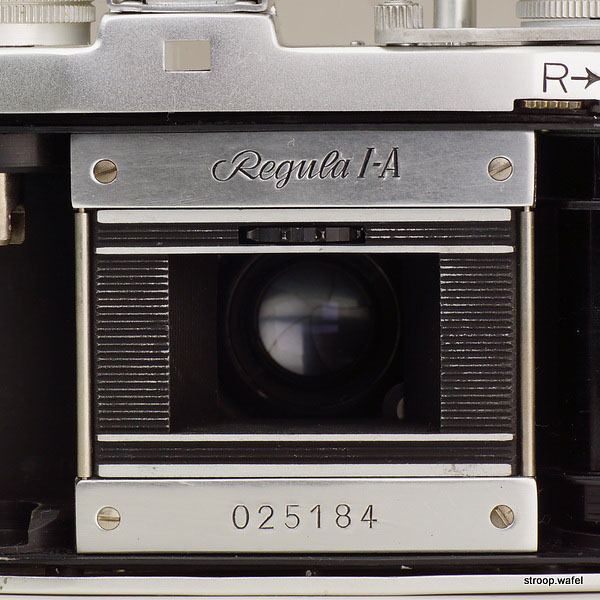 Inside of a King Regula IP, showing the engraved model name and serial number characteristic of all Series I King Regula cameras. 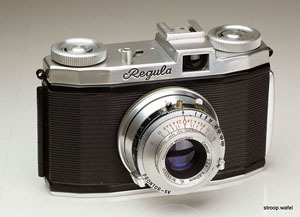 Another variant of the first version of the King Regula IP with Staeble Kata lens and an accessory shoe, which was probably a later addition. Body serial# 004396. 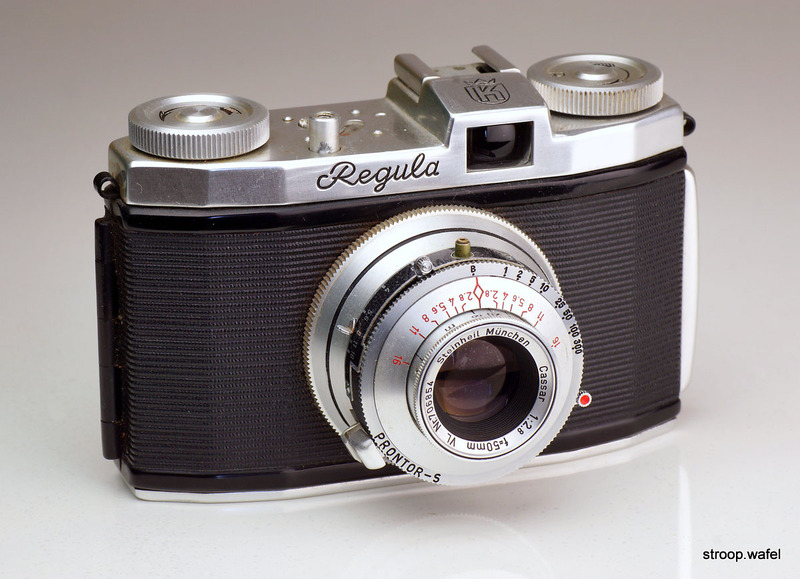 Later version of the King Regula IP with slimmer body, frame counter integrated in the top housing, an accessory shoe behind the viewfinder and a round lens base. 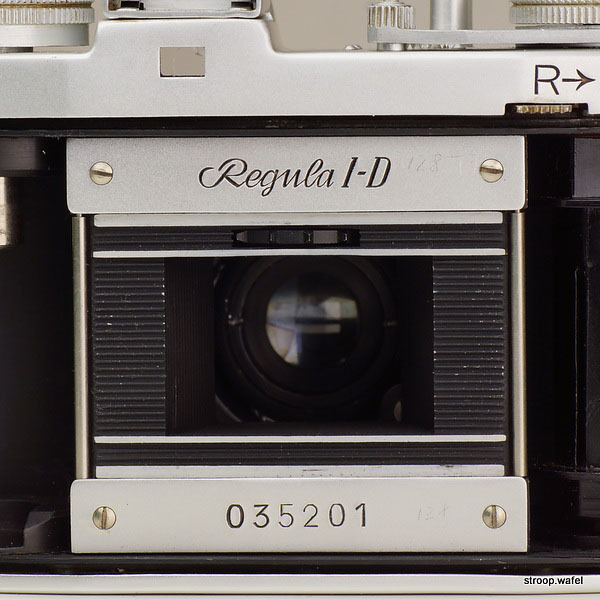 The latch to open the camera was also different and the camera had King Regula engraved on the front. Early production (left) one had a Prontor-S shutter with a depth of field ring covering the original black shutter plate. Later production (right) had a Prontor-SV shutter and a larger depth of field ring. The original black shutter plate was no longer present. The King Regula II was introduced around the same time as the King Regula IP. There were several variants, similar to those of the King Regula IP, and I have in fact found very little difference between the King Regula IP and II models. 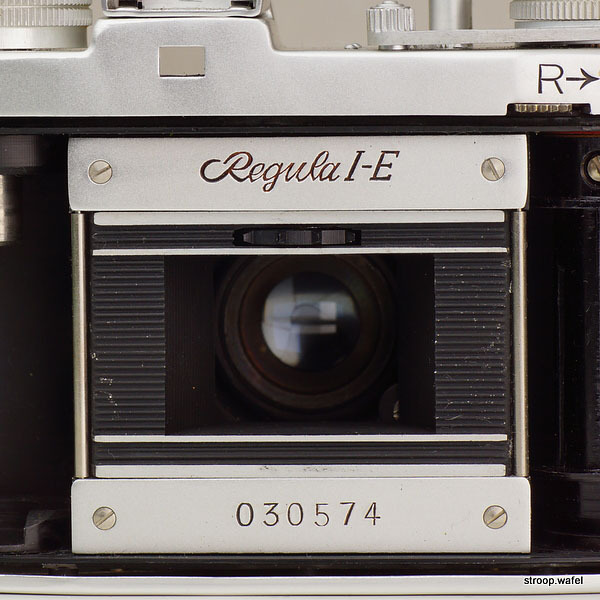 Only the lens speed was different, all King Regula II had a fastest aperture of f/3.5 instead of the f/2.8 lenses on the King Regula IP. Available lenses were Enna Ennagon and Staeble Kataplast. 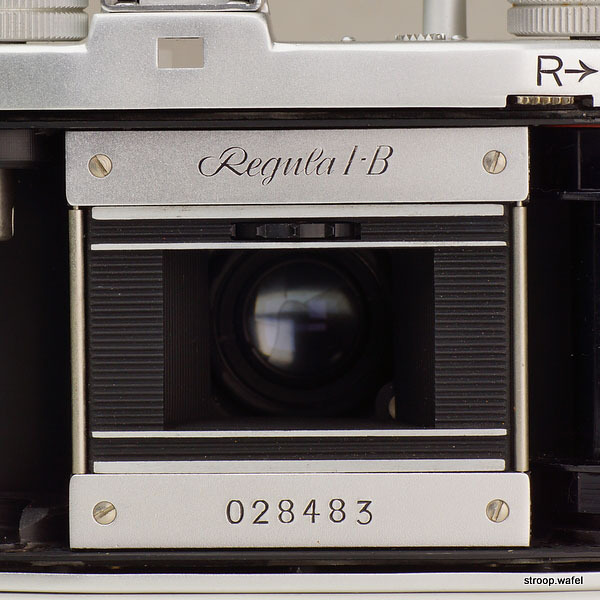 First version of the King Regula II with Enna Werk Ennagon 50mm f/3.5 lens. 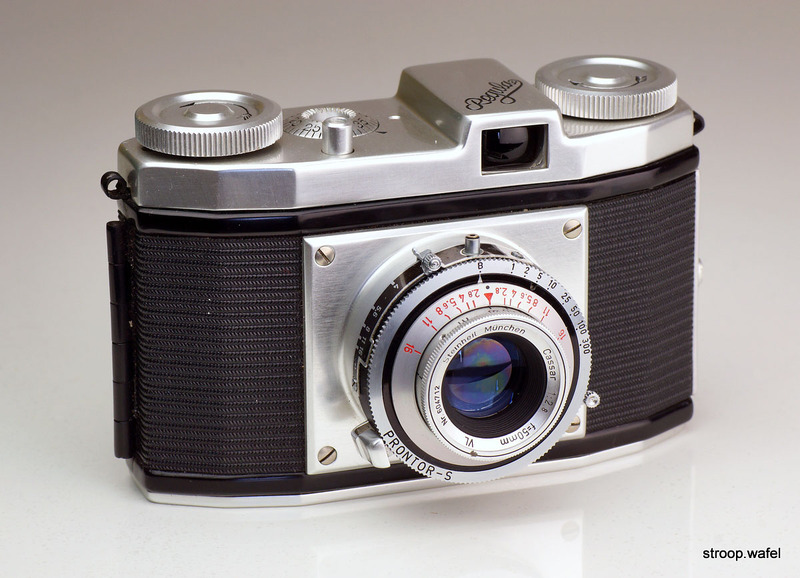 This model had the same wider body and flat viewfinder top as the early Regula IP models. Body# 003033. 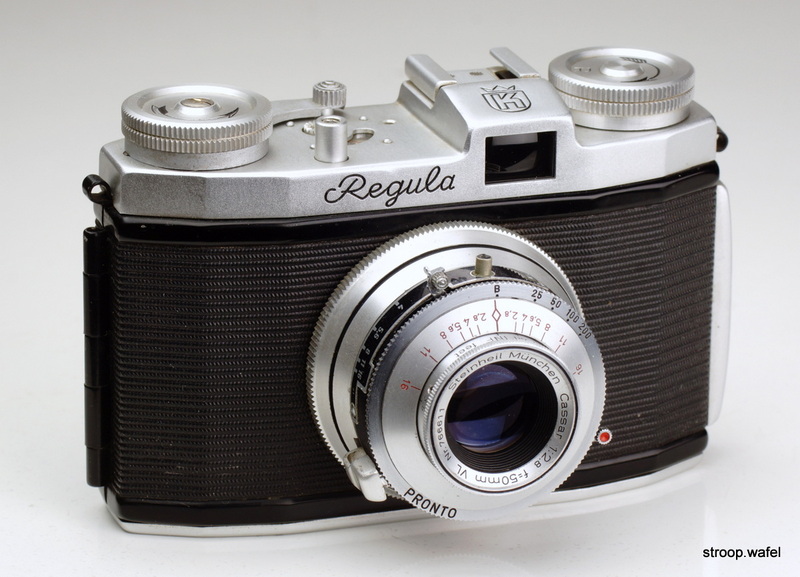 Another example of the first version of the King Regula II, here with Kata 50mm f/3.5 lens. 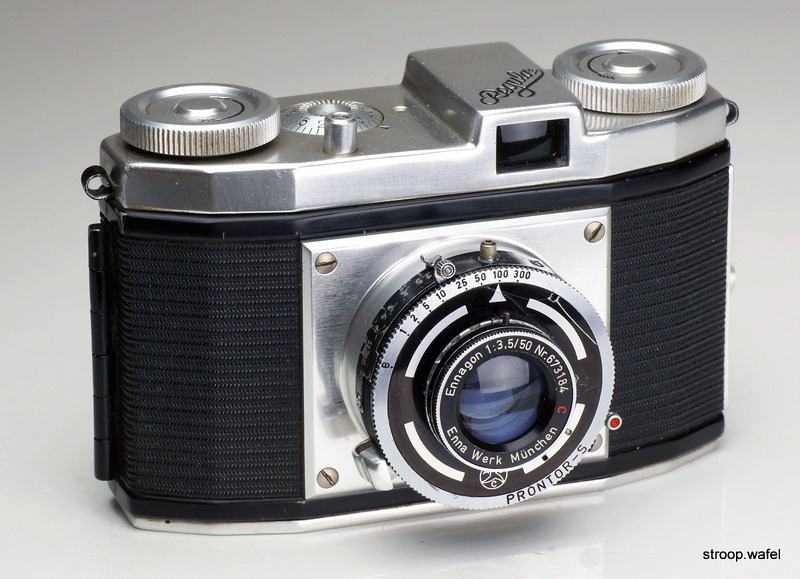 Note the depth of focus ring which was added to the shutter assembly, the original black shutter plate as on the example with Enna lens above was still present. 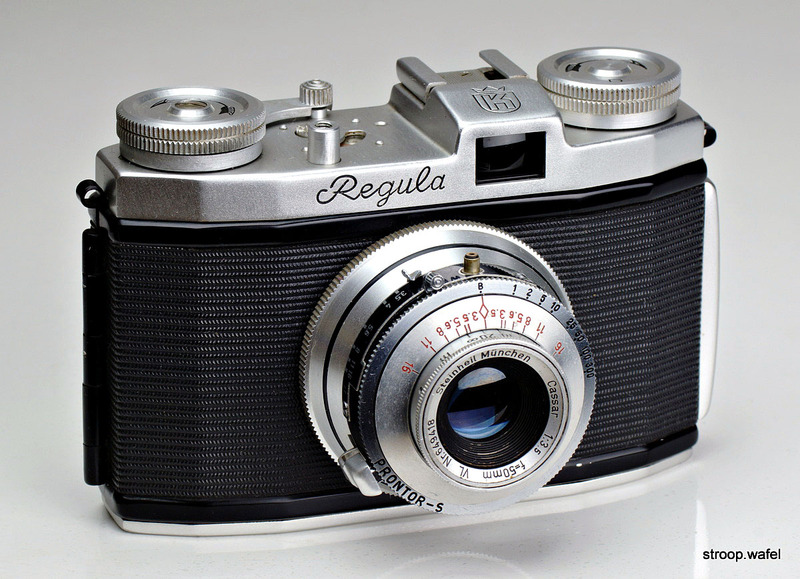 Second version of the King Regula II with Kataplast 50mm f/3.5 lens. I am not sure there was any difference between Kata and Kataplast lenses. The main difference between this and the first Regula II version was the thinner body, frame counter and the addition of an accessory shoe. Rear view of the King Regula II above. 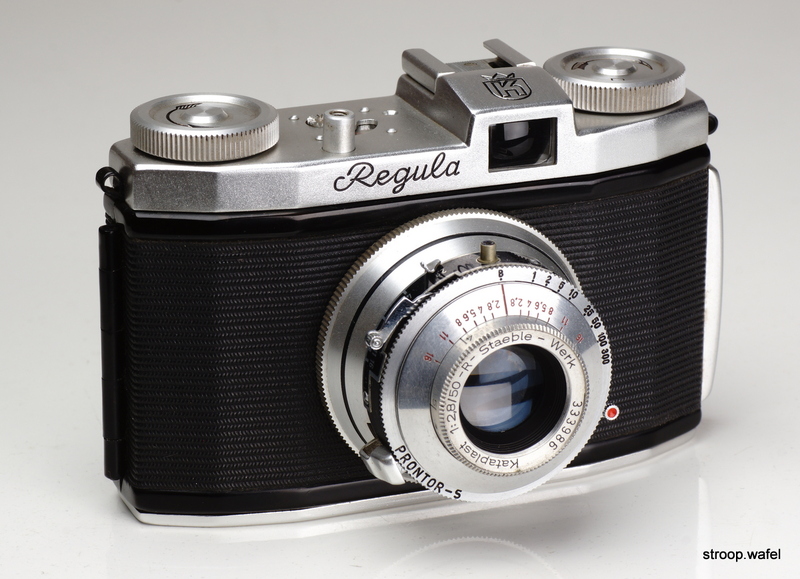 A third version of the King Regula II was essentially a King Regula I-P (see below) but again with a slower f/3.5 lens. These were most commonly f/3.5 Cassar lenses but late models can also be found with f/3.5 Regulon. In addition, one had a choice between models with and without wind lever. 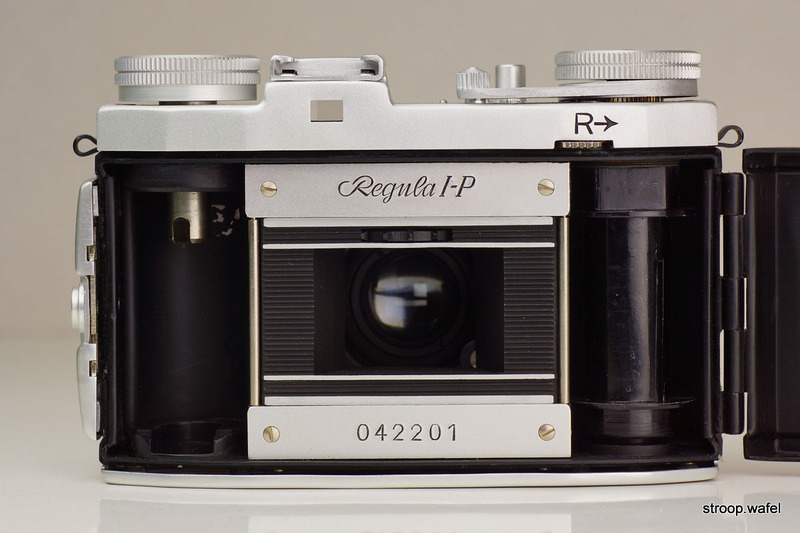 The King Regula I-P was very similar to the late version of the King Regula IP, but the viewfinder housing was different as it had a King emblem engraved on it and it was slightly slanted. It also had a slightly smaller frame counter window. 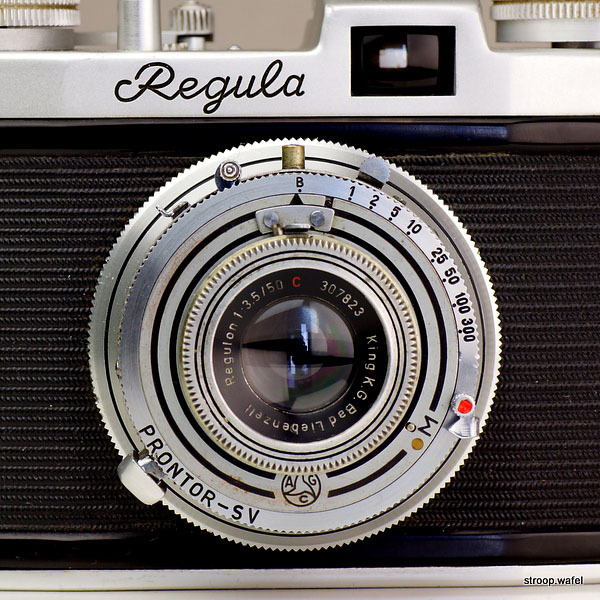 All following King Regula I series models had identical bodies but featured different lens and shutters. 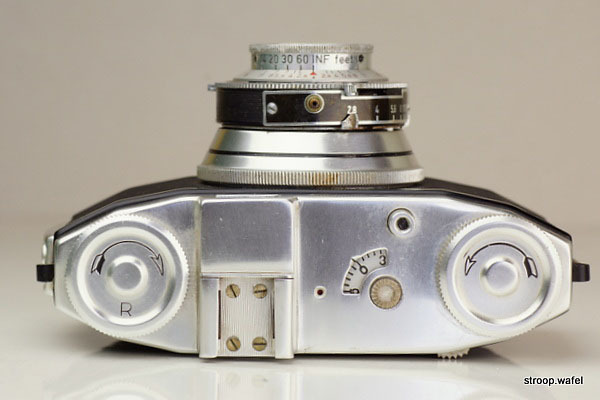 The only other variations was the styling of wind and rewind knobs (see below). Furthermore, a wind lever was introduced as an optional feature, indicated in catalogues as 'ST' models (from Schnell-Transport, German for rapid transport), as can be seen in this brochure (in German). 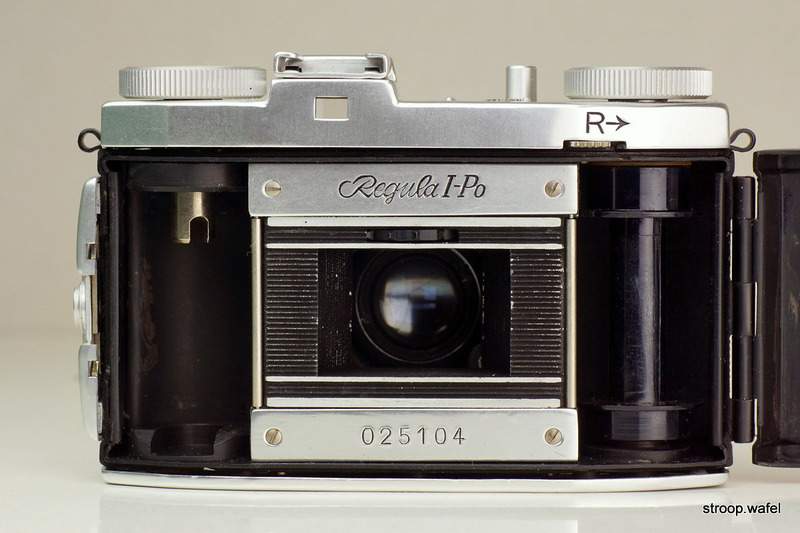 King Regula I-Ps had Prontor-S or Prontor-SV shutters and came with various lenses, including Steinheil Cassar, King Regulon and Staeble Kata lenses. A King Regula I-P with Steinheil Cassar, the most common model, with wind knob. Two variants of the King Regula I-P with different lenses: (left) with King Regulon 50mm f/3.5 lens and (right) with Kataplast 50/2.8 lens. 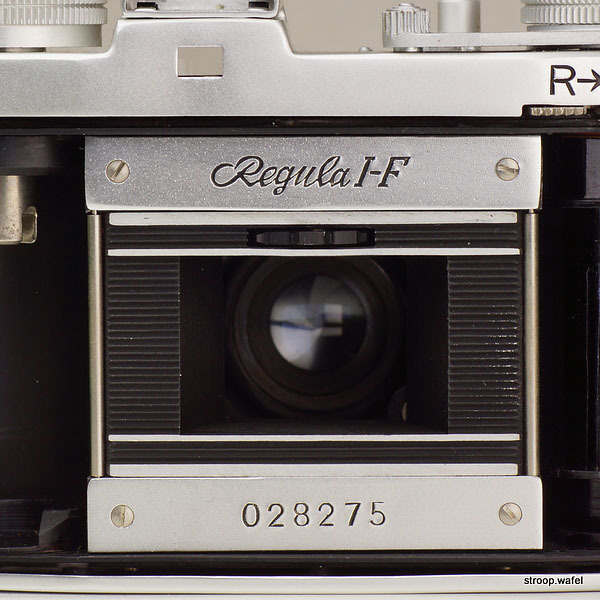 It is unusual to find a King Regula I-P with a f/3.5 lens, as normally these were normally fitted to King Regula II models. Inside of the King Regula I-P ST with Regulon f/3.5 lens. 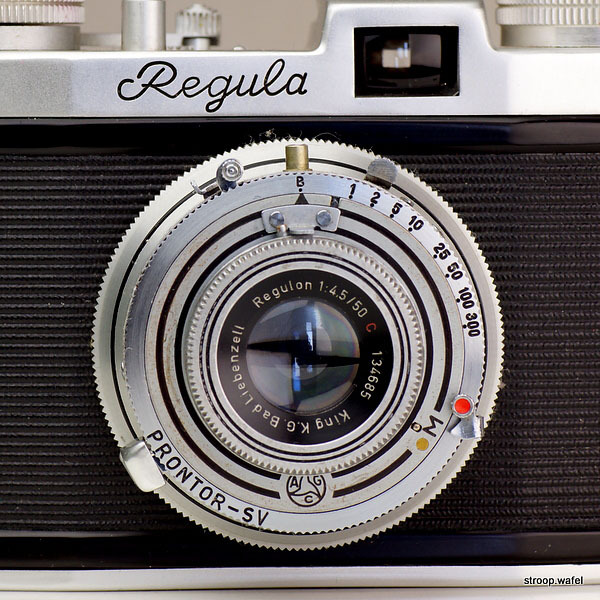 Winding mechanism of a King Regula I-P featuring double exposure prevention, frame counter and wind lock indicator. 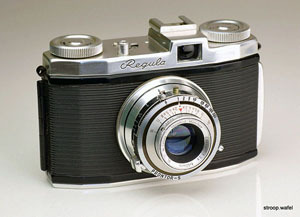 The King Regula I-Po was very similar to the I-P but had a four-speed Pronto shutter. 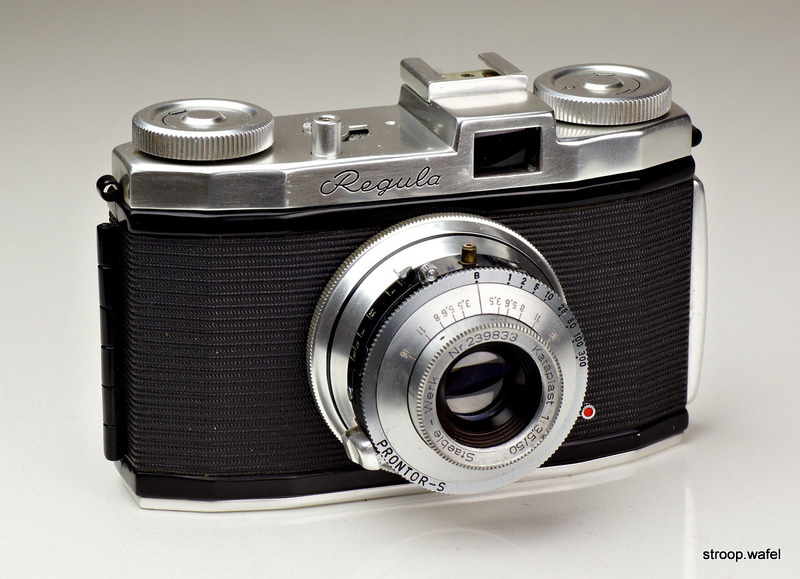 A King Regula I-Po with Steinheil Cassar 50mm f/2.8 lens in Pronto shutter. Inside of a King Regula I-Po. Version of the Regula I-Po with windlever. 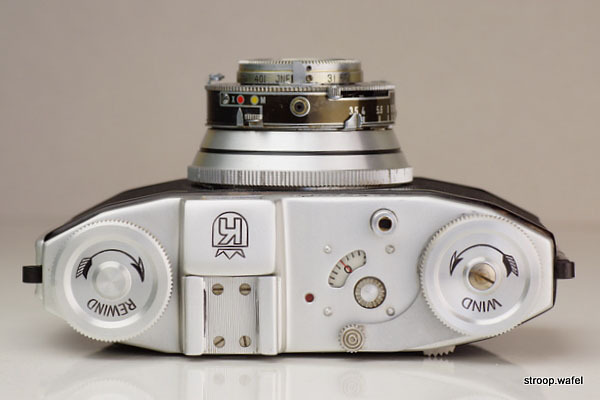 Note that models with windlever also had a slightly higher rewind knob to make it the same height as the wind knob. A nice touch. 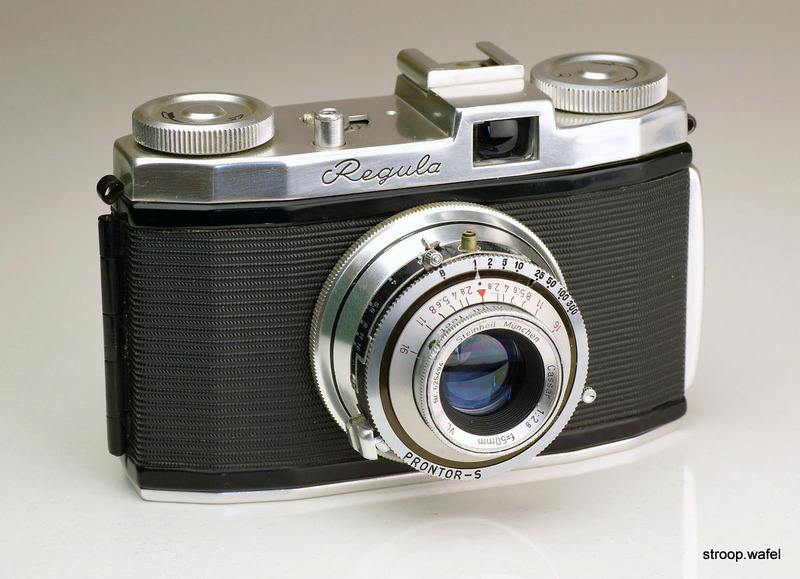 The King Regula I-C was also similar to the I-P but had a Compur-Rapid or Synchro-Compur shutter. It can be found with wind knob or winder lever. It was arguably the top model amongst the first generation King Regulas and identical to the King Regula I-A below. 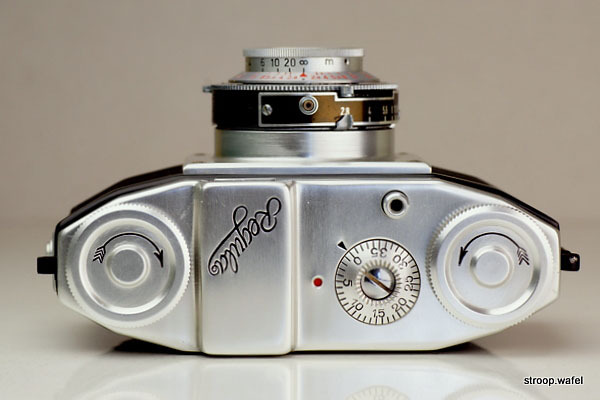 It was marketed together with the King Regula I-P and II, as indicated by the camera manual, which was the same for all three models (see here), as well as in sales brochures like this one (in German). 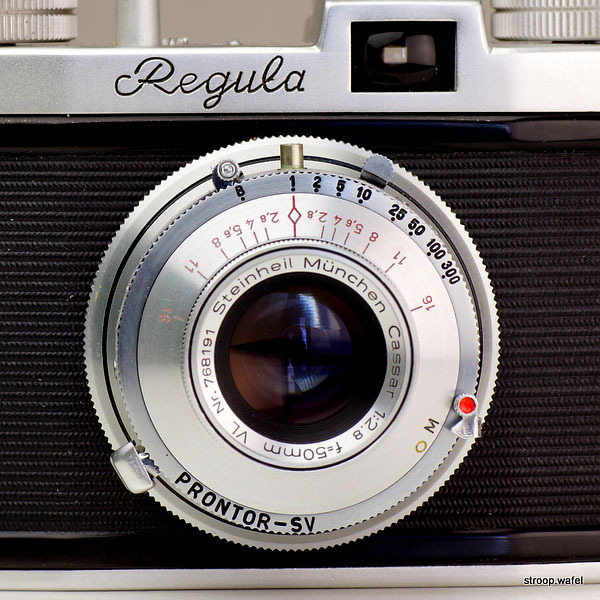 Hence, the Regula I series was named after their shutters: I-P = Prontor-S(V), I-Po = Pronto, I-C = Compur-Rapid (or Synchro-Compur). A King Regula I-C with Steinheil Cassar lens, Synchro-Compur shutter and wind lever. Film gate of the King Regula I-C with engraved name plate and serial number plate. Note that I have left out the I-C, as it was identical to the I-A and was marketed together the I-P and I-Po models instead. In addition, in catalogues such as the 1954 'Photo Equipment Guide' published by U.S. Camera Magazine it was the only model lacking from the list. The prices above are from that same guide and included a case. In summary, it appears the Regula I-A to I-F, excluding the I-C, were export models for the USA. Indeed, all examples I have seen so far had focus distances indicated in feet. The Regula I-P, I-Po and I-C were for the European market, including the U.K., as they can be found in meter or feet versions. 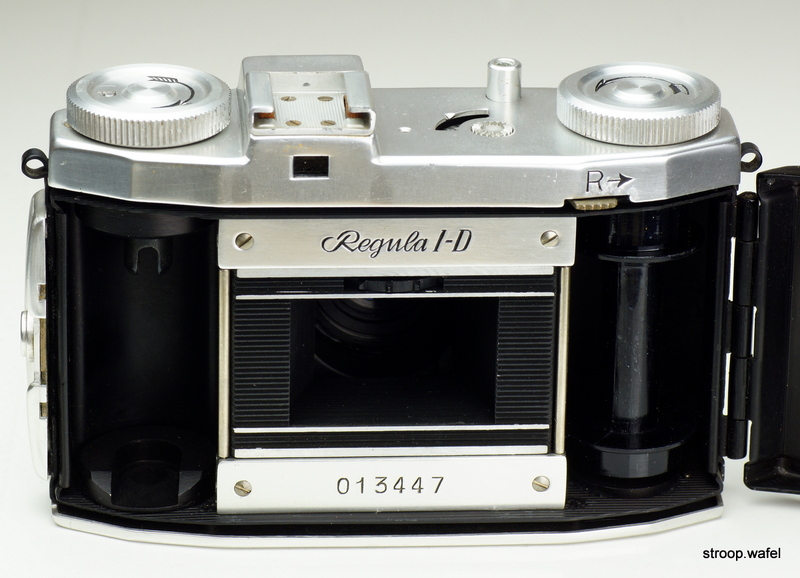 To add to the already considerable confusion of King Regula models, a version of the King Regula I-D exists that has the body of the late version of the King Regula IP (with flat viewfinder top) and a Cassar f/3.5 lens in Prontor-SV shutter. This begs the question if perhaps there were early versions of the other models too? 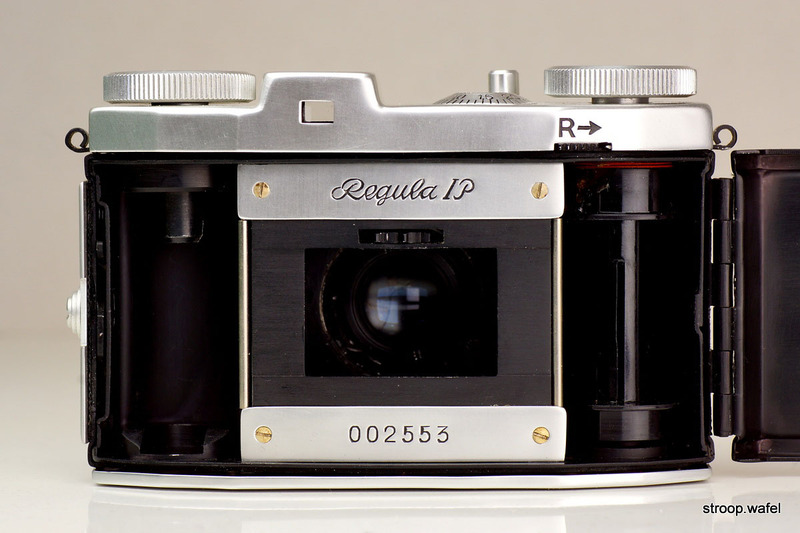 Early King Regula I-D with body of the late version of the King Regula IP and a Cassar f/3.5 lens. Top views of several of the cameras above show details of differences in body styles. Note that all cameras apart from the IP and I-Po could come either with a wind knob or wind lever.